If you’re looking for a healthy pizza, then most frozen pizza and chain-store pizzas are off the table. But this homemade artichoke pizza recipe is a delicious and healthier alternative. 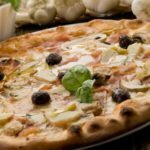 To make a delicious gourmet pizza at home, the only ingredient you might need to add to your grocery list is active dry yeast. Add the yeast to warm water right away while you prepare your other pizza ingredients. If you have a stand mixer, use the dough hook and let the mixer do the work. Between 10 and 15 minutes in the stand mixer will get your pizza dough nice and workable. Don’t have the time to make your dough from scratch? A whole-wheat pizza dough from the grocery store works well, too. Making pizza at home has never been easier with this recipe featuring artichoke hearts, sliced mushrooms, and fresh olives. Place yeast, water, and sugar in a medium bowl. Let stand for 10 minutes, or until yeast become foamy. Spread a thin layer of marinara sauce over dough. Season with oregano, Italian seasoning, pepper, red pepper, and garlic powder. Top with artichokes, onion, mushrooms, and olives. Bake for 10 to 15 minutes, or until crust is golden and cheese is brown. Add protein and more veggies for lunch.